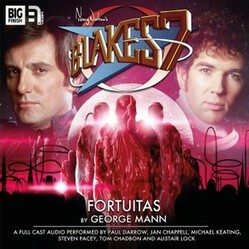 The search for Dayna continues in Fortuitas, the second in the second series of Blake's 7 full-cast audio plays from Big Finish. The Liberator crew find themselves on the recreational planet Solace in the second adventure in the series as they continue their search for Dayna. But there is little time for pleasure as there is a mystery to be solved, that of disappearing people. And there is also the involvement of a right-wing extremist group called Fortuitas. The quest to find Dayna continues in the second adventure in the second series of full-cast Blake’s 7 audio plays from Big Finish. Set in the third season of the original BBC television series, 2.2 Fortuitas continues the arc started in 2.1 Scimitar where the crew find that Dayna has mysteriously disappeared. That this story line came as a result of original actor Josette Simon turning down the chance to reprise the role that made her famous is irrelevant as the play brings together Paul Darrow’s return as Kerr Avon, Michael Keating as Vila Restal, Jan Chappell as Cally, Steven Pacey as Del Tarrant and Tom Chadbon as Del Grant. Alistair Lock plays the computers Zen and Orac. Guest stars are Hywel Morgan as Marl Ranking and Jo Howarth as Eva. Written by George Mann, the story takes them, much to Vila’s initial delight, to the recreation world of Solace. But Avon is there because he wants to meet Marl Ranking who claims to have news of Dayna but it turns out that she is just one of a number of people to have disappeared, including Ranking’s wife Eva. Tarrant though asks one too many questions and ends up being taken as well. And where does the right-wing extremist party Fortuitas fit into all this? This is one of the most political of these plays and good for that. It is also a mystery story and one that flows nicely and is easy to follow. A shame more use could not have been made of Cally and Vila, but it is hard to have equal shares in every episode when you have such a big cast. The scene where Orac guides Grant in fighting is one of the funniest on any of these productions. Marl Ranking comes across as a bit wimpy for someone whose job is selling information to undesirables while trying hard to stay alive, but that is a minor criticism of what is overall a good play. The extras start with Alistair Lock and Lisa Bowerman talking about the production. Alistair gives some insight into how he got the role. We then hear from writer George Mann of how he came to know Blake’s 7 and how he goes about the writing process. Justin Richards compares this with the original TV series episode "Mission to Destiny" and how he balances the mystery elements with a normal adventure. The two guest stars Hywel Morgan and Jo Howarth talk about their roles. Recorded at Audio Sorcery and directed by Lisa Bowerman, the hour-long Fortuitas is available from Big Finish both as a single CD and as a download. Its production code is BFPB7FC009 and its ISBN 978-1-78178-405-1. The music was by Jamie Robertson and the sound design by Martin Montague. The cover art is by Grant Kempster. The producer was Cavan Scott, the script editor Justin Richards and the executive producers Jason Haigh-Ellery and Nicholas Briggs. The download also comes with a copy of issue 70 of Vortex magazine, which sadly, apart from a one-page advert, has no Blake’s 7 in at all. You can though learn about the latest Doctor Who releases along with Sherlock Holmes and Survivors.